I finished Cauchy on the first of the month, so pretty close to what I was aiming for! No pics yet – I’ve got some of the socks on my blockers, but am still trying to talk T into letting me take a modeled shot. We’ll see what happens with that. As for the yarn, I’m really not sure what it is, since I seem to have lost the label. I know I got the partial ball from Jessica ages ago, because I wanted to swatch it and then maybe get more for a tank top, and I know it’s from Knit Picks. And I’m pretty sure it’s a cotton blend. Beyond that, your guess is as good as mine! I made modifications for gauge and size (since as you can see, this is for a can). Easy, quick project. The cozy basically lives in my camping backpack, since camping trips are pretty much the only time I drink anything from a can. Also it makes it easier to tell my drink from someone else’s, if I’m not the only one in the group who’s opened a can of something. 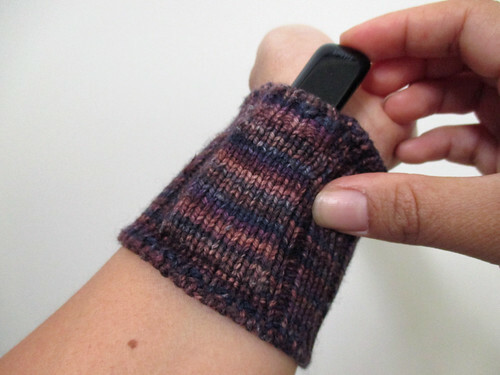 It’s a self-designed wrist band for my Fitbit One, because the strap it came with is incredibly uncomfortable and so I kept taking it off in my sleep, basically defeating its purpose. This one, on the other hand, doesn’t bother me at all! 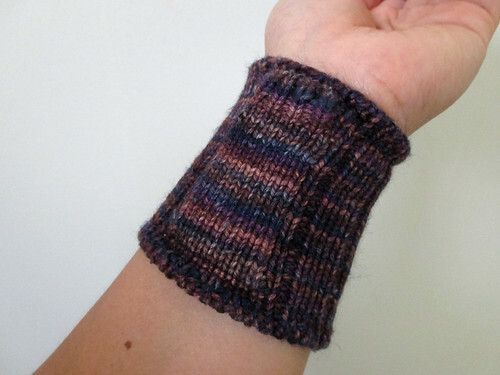 The construction’s pretty simple – it’s basically a mostly 3×1 rib cuff with a knitted on pocket. Still, I’m pretty pleased with how it turned out. That’s all for the small projects; bigger ones to follow! 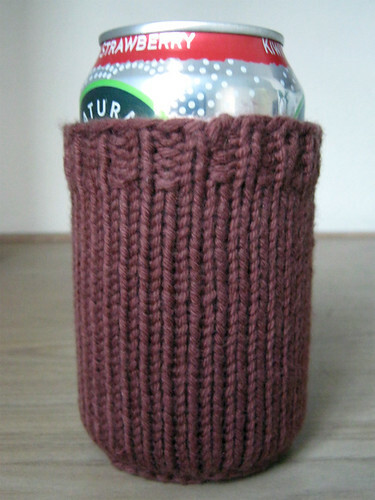 This entry was posted in Knitting and tagged Fit for a Fitbit, Garter Coaster Beer Cozy. Bookmark the permalink.